Early on in her youth, Ruth Kerr indicated excellence in her sport. Kerr held several records in the early days of competitive women’s swimming in Canada. At one momentous Kennedy Collegiate meet, Kerr swam her way to five Canadian records. 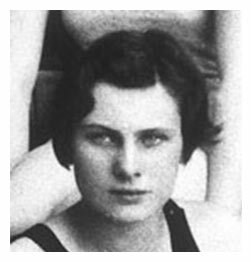 In the 300-yard freestyle event, she ended up shaving an impressive 5.6 seconds off Irene Pirie’s Canadian record time.² By 1930 her family had established the Border Cities Swimming Club, which became one of the largest competitive swimming groups in Canada. Young Ruth then competed in the inaugural Canadian National Exhibition Marathon Swim, placing second in the long-distance open-water race against all other competitors. The Swimmer; the official publication of the Canadian Amateur Swimming Association, identified the Kennedy Collegiate student as Canada’s leading woman in her sport, making her an excellent candidate for the 1932 Canadian Women’s Olympic Swim Team. She was so respected she did not have to participate in the qualifying trials. Kerr was the first Windsor-born athlete to participate in an Olympic Games.³ Only a 16 year-old young lady, she was the youngest member of the Canadian team which finished fourth in the 4×100 backstroke relay. Ruth swam the third leg of four in the relay. She was also the youngest member of the 1932 Canadian Olympic Team. As an athlete Ruth Kerr was certainly an important contributor to Windsor and Essex County. However, as a young woman and representative of our community at the Olympics and other athletic competitions, on an international level she exceeded expectations and acted as a delegate for Canada. This is a person we should all remember. (4) “Ruth Kerr.” Ruth Kerr. 2015 Accessed December 12, 2015. (5) “Olympic Statistics.” 2015. Accessed December 12, 2015.